After years in decline, the Roman Catholic Church is experiencing a resurgence in popularity with Pope Francis credited with filling the pews again, reports the Courier-Mail. Catholics across the globe are apparently going back to church inspired by the charismatic Argentinian-born Pope Francis and his refreshing approach to modernise the church. The Italian Centre for Studies of New Religion has branded it the "Francis effect" where in Great Britain, largely a Church of England nation, Catholic congregations alone have risen by 20 per cent. Similar support for the church is being experienced elsewhere in the world notably Italy, Spain, France, Latin American and the United States. More than half the priests surveyed in Italy cited a rise in support for the church, similar reports too from Spain where the clergy is reporting an end to a decade long decline. Every time the 76-year-old pontiff conducts a papal audience in Rome, 85,000 people surge into St Peter's Square to hear him, numbers not seen, except for special events or festivals, for years. Many church clergy in Europe have cited the pope's down-to-earth attitude in everything he does, from his shunning luxury papal accommodations to instead stay in a modest apartment, through to carrying his own bags as part of the church appeal. Luxury papal cars have been replaced by a Ford Focus. The UK's Catholic Herald this week called on priests across the nation to follow his lead and his "electrifying effect on Catholics in the UK". Archbishop Vincent Nichols, head of the Catholic Church in England and Wales, has hailed the Francis effect saying: "God's love shone through the words and actions of Pope Francis." 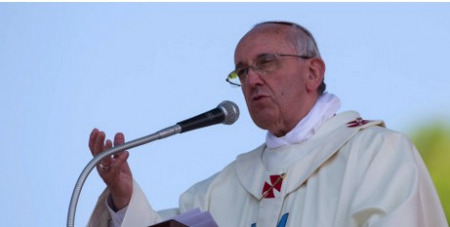 The pope during his Sunday address joked he was liked a pharmacist.